What is Gauge? | Types of Gauges are used in measurement? HomeMSAWhat is Gauge? | Types of Gauges are used in measurement? What is Gauge? 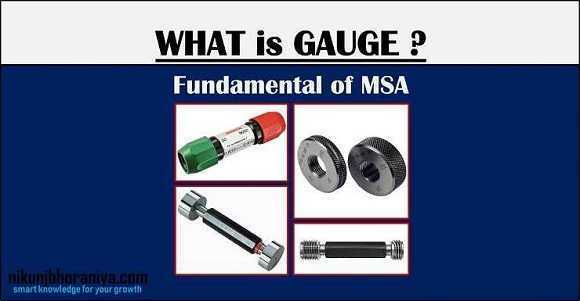 | Types of Gauges are used in MSA? 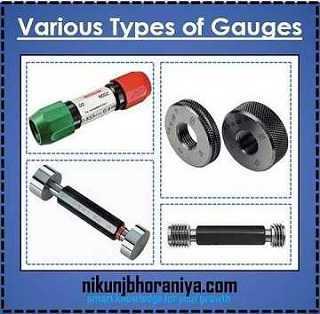 → Gauges are the inspection tools without scale which are used to check manufacturing parts. → Gauges do not indicate the actual value of the inspected dimension on the parts. → They can only be used to determine whether the inspected part has been made within the specified limit. → A clear distinction between measuring instruments and gauges is not always observed, at that times Gauges are used largely for measuring work. 1) Types of Gauges are used in measurement? → The gauge has no accurate standard measurement but it is made from some relative reference is called non-standard gauges. 3) Why Gauges are needed? 4) How to use Gauge? → Do not use it as a hammer, this will cause deformation. → Avoid any hard/sharp object to come in contact with the gauge, this will cause a dent/scratches on the surface. → Do not force it inside the hole to be measured, this will cause fast wear and damage, Let the gauge enter the hole with its own weight. → After usage, grease/oil should be applied and kept at a proper place.